This week’s a nightmare. So I’m gonna make this one a bit shorter than usually (yes, you’re welcome). 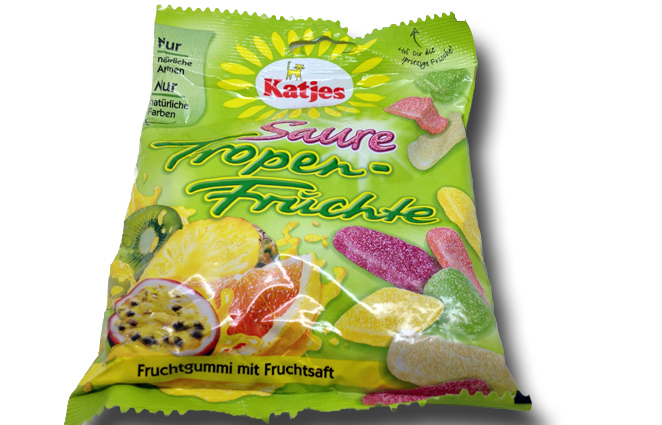 Katjes makes some of the best gummies and licorice on the market. We’ve reviewed quite a few, and trust me, you really can’t go wrong with them. One of their products (yet to be reviewed) is their Tropical Gummies. I’ve had them a few times, and they’re good. Not quite a classic chew like a gummy bear, and also not on the other end of the spectrum : they’re sort of a hybrid gummy. Chewy, but they break apart relatively easy. Really nice, actually. 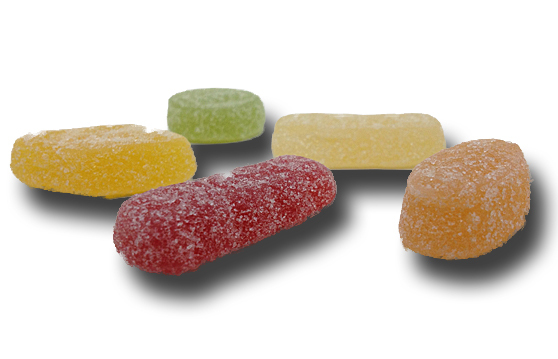 These are simply those gummies, sour-ified. But wow, what a difference it makes. The flavors are what’s really special with these: passion fruit, kiwi, grapefruit, “tropic”, “exotic” and pineapple. Let’s just throw those two ambiguous non-flavor flavors out, and focus on the rest. Passion fruit, grapefruit, pineapple? Please. Those are worth the price of admission alone. On the sour scale, I’d give these a nice 6, Delicious, sour, but the sour’s only there to compliment the flavor, which I like. No puckering. These are seriously yummy eats. While these were sent to me from my fave German, the good news is that you too can get in on the action. Click the link below to purchase,e and while you’re there-look around for some other Katje candies. You won’t be sorry. 2. You should stop expecting people/things/candies/life to be “good”. Just anticipate “bearable” and you’re less likely to be disappointed. 3. I never promised you a rose garden. 4. Here’s the really bad news: you have horrible taste in candy. Seriously. If you don’t like these, we should break up right now.